← POLL: After Halloween is over, what do you do with your decorations? About 10 years ago, I walked into a store on Ventura Boulevard in Los Angeles that I had passed a few times, but never went in. It was one of those stores that sells really cheap knock off toys, like “Magic Harry” and “Spider Guy.” Well, in the back of the room, there was a large glass case covered with boxes and other things. I looked inside and it might as well have been 1984. It was filled with merchandise featuring He-Man, Transformers, Go-Bots and more- all with the original price tags! Probably needless to say, I bought them all and sold them on eBay, except for what you see here. My plan was to save these items in case I had children of my own. Well, being 13 nieces and nephews deep, I think I’m all set. But if I do have children someday, I’d surely encourage them to wear pre-owned clothing like I do. Plus, I was way more into G.I. Joe. So, as I continue purging my possessions, all of these items are now available on eBay. Yes, you’ll notice that these items do have hefty price tags, but I did the research to see what they’re worth and you can also make offers. Plus, the money I make on these will directly support my continued work with reuse. And that’s more than meets the eye! (Sorry. Had to.). 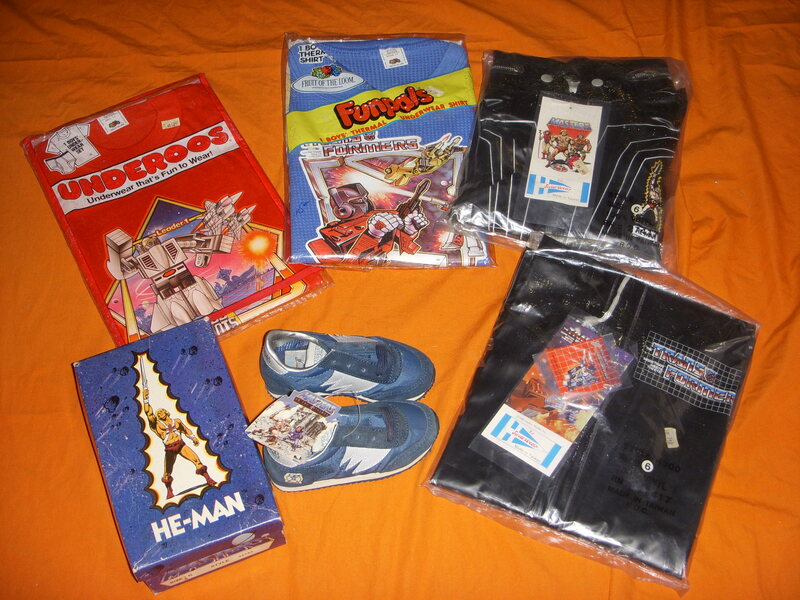 This entry was posted in Clothing, collecting, Family, Growing Up, Shopping. Bookmark the permalink.